IF YOU HAVE ANY QUESTIONS CONCERNING THE FOLLOWING, PLEASE SEND US AN EMAIL AND WE WILL RESPOND. FOR SOUTHERN ETOBICOKE, CITY OF TORONTO May 2016 Rev. Copyright 2008-2016: Paul Chomik, P.Eng. Taxpayer money should not be used (WASTED) to purchase VERY EXPENSIVE Christies (Employment) land from wealthy private developers, when public lands are already available. By the time the new GO Station and platforms are built, the City and Province will have integrated fares between the TTC and GO trains, so that residents can travel up to three Streetcar stops from Park Lawn to Humber Loop and use the GO train for an integrated fare. Park Lawn Rd. to Humber Loop along LSBW is approximately 800-metres, making it a 5 to 10 minute walk home for Motel Strip residents in nice weather. A new Pedestrian/Bike path can be created to run from Mystic Point to Humber Loop over public lands (see picture). If a future, additional LRT/Streetcar route is added along The Queensway it can only connect with a GO Station at Humber Loop and not at the Christies site or Park Lawn Rd. Placing the new GO Station at Park Lawn Rd is not convenient (and all up hill) for condo residents in the Motel Strip condo area. It is also a longer distance to walk for a considerable number of Motel Strip residents compared to the Humber Loop location. Metrolinx has determined they will NOT have a GO Station at Mimico and Park Lawn Rd. – it’s one or the other, since they are too close to each other and do not meet the minimum separation distance requirement. 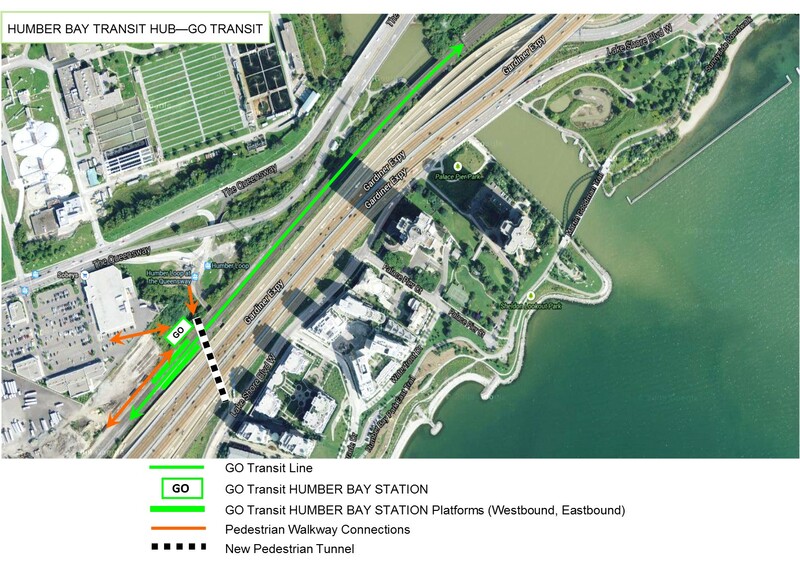 Humber Loop, however, is an acceptable able distance from the existing Mimico GO Station to meet the Metrolinx minimum distance criteria between stations. 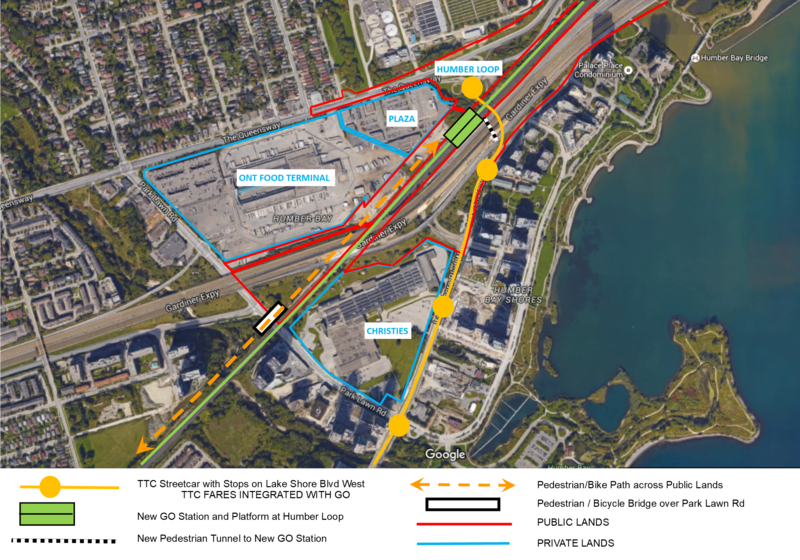 There is no need to “study” the Park Lawn Rd area or “negotiate” with developers for Christies land – start planning and building the new GO Station (with no parking lot) at Humber Loop without delay.